The Empty Bowls Virginia Peninsula committee accepted grant applications from December 15 through January 31 from local organizations with programs that provide meals or groceries to people in need in our Peninsula communities. The committee then and selected grant recipients from those applications. Funds raised at the Empty Bowls Virginia Peninsula event go to feed people in need. While we may select organizations that provide for other needs as well, the funds Empty Bowls donates are committed to be used to fight hunger. Each year, decisions are made after review of the materials submitted. We are challenged to select organizations and make meaningful awards. To be eligible for consideration, an organization must be a nonprofit with tax exempt status, must be located on the Virginia Peninsula (as far west as Williamsburg/James City County to as far east as Hampton), and must operate programs that help to feed people in need in Virginia Peninsula communities. 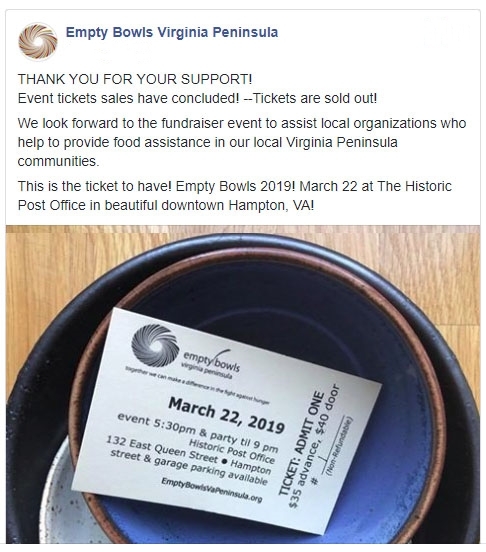 Due to the generosity of local artists, our ticket buyers, board members and volunteers, and cash and in kind-donations from businesses and sponsors, the Empty Bowls VA Peninsula has been able to donate to local charities an average of 95% of all event proceeds.